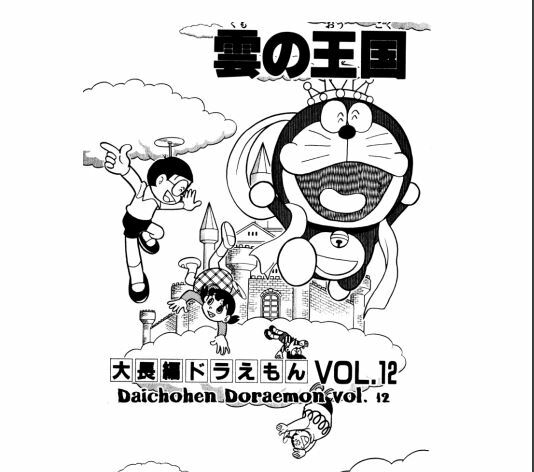 Doraemon’s story is one of the amazing cartoon stories of child’s world. Child’s like Doraemon’s story too much and the watch its every movie with full of interest. Doraemon’s all story’s moves around robotic kind of cat which have gadget and he can do anything by his gadget. Nobita’s school teacher gives the research topic to all of them. Shizaku is preparing well her research. But nobita is so upset about own because he doesn’t know what he shall do? He is so disappointed about his research. Jian and suneo are not preparing their research too. Jian is doing nothing but suneo is doing something useless. Suddenly nobita comes and watches them and don ‘t satisfy to their work.and nobita goes away. Doraemon orders something for nobita’s research which nobita receives .doreamon and nobita start working slowly they select a topic to make the world. Doraemon gives stick to nobita and tells him lets mix these items while mixing stars becomes. Nobita asks for Doraemon when Adam and edi will come.Doraemon replies to him after many time. Jian and suneo are doing many funny acts. Which are not related to the topic? Suneo flies balloons everywhere thinks that who will catch these balloons. He will contact me then I will ask him the place where does he live. Suneo is mentioning his contact number on ballons. Suneo plan fails when many days later no one contact with him. Jian angry at him and thoughts that I shall go to nobita’s home. Nobita must be making better research with help of Doraemon. Nobita would like to watch our work but he couldn’t. Doraemon provides him ufo camera. Doraemon says that he can observe his work by ufo camera. Nobita starts watching and he is getting satisfied with his work.evrything is going well. Nobita happy to see own his work is going well. Nobita says to doreamon can see this view which we are making with naked eyes. Doraemon says yes why not let’s go they enter the world. And see many amazing views there were stars in the sky everything was looking true and they are feeling so happy. Doraemon and nobita listen strange kind of voices from there.they say jellyfishes other amazing creatures in the sea.and they come back. Jian and suneo also be part of there research .and they all come to visit the world which Doraemon and nobita are going to make. 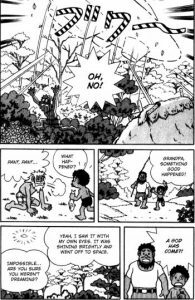 They become shocked to see the world that how it looks.they say the forest people in the earth they are burning a fire cutting the trees.nobita gives them many tiny planks of wood by the help of Doraemon’s gadget .they say elephants many more different types of animals in the forest. There were many creatures in the world strange kind of creature was there. They don.t like human beings. They say that human beings are creating the problem for us they have to leave the earth otherwise we will attack them. But Doraemon and nobita solve all the problem and they become happy at the end they all come back home. 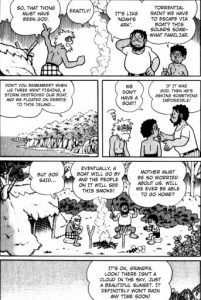 In this story they all friends perform a research together Doraemon and nobita selects the topic to make a world and would like to know about its past situations. Doraemon and nobita prepare it and observe it with naked eyes they say many various kinds of creatures in it. And they all friends enjoy so this research and learn many beneficial things to this research.